Founded in 1979 by Günter MEINHART, over the past almost 40 years STUDIO PERCUSSION graz has conjured up an impressive number and variety of productions on all kinds of stages, both at home and abroad. Exciting projects in the contemporary field, exploratory collaborations with musicians, composers and event organisers in the fields of jazz and classical music, special programmes for children and young people and a passion to create their own musical theatre productions, have consistently characterised the work by STUDIO PERCUSSION graz. Günter Meinhart was born in Graz and there he studied percussion instruments at the University of Music and Performing Arts, where he has worked as a contract teacher since 1995. 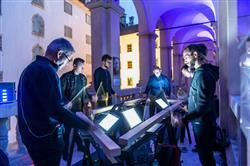 Meinhart runs workshops and seminars at home and abroad and stages numerous events with his group STUDIO PERCUSSION graz. He also leads the AUSTRIAN PERCUSSION CAMP as artistic director since 2009.